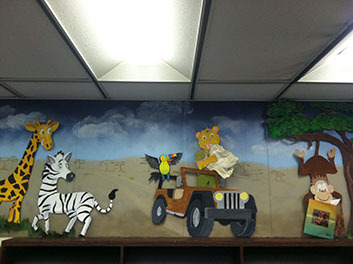 Five Points students are WILD about reading! The fully automated Media Center is open for checkout from 7:30 AM until 1:50 PM on an on-scheduled basis. Students may check out 2 books for 10 days. Accelerated Reading is supported by arranging books by reading level. Our Media Center houses our live morning announcement show that is televised throughout the school. The “Morning Wave” crew consists of select fifth graders that must audition at the end of fourth grade. The Media Specialist and staff strive to make the Media Center bright, cheerful, attractive and inviting to all patrons.